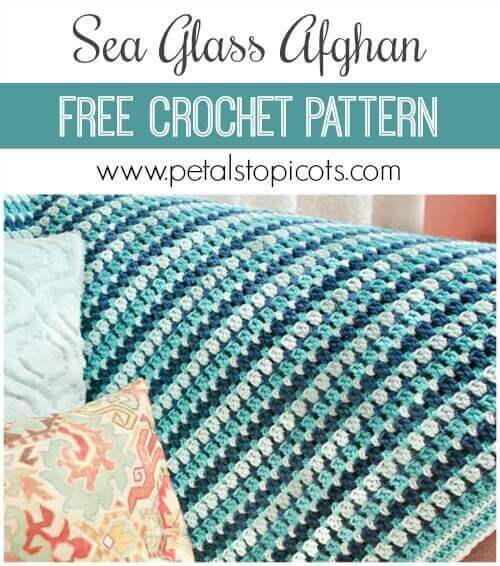 I am absolutely in love with this Sea Glass Crochet Afghan Pattern! Working on this blanket has been such a joy with its simple and repetitive stitch pattern that lets your mind wander as you work … so restorative and meditative. I also love the colors which remind me so much of sea glass. Hope you love it as much as I do! Finished afghan measures 54 in. wide × 73 in. 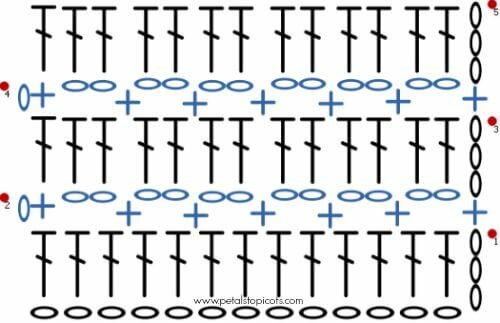 long but can be customized to any width by working any even number of stitches. Note: Carry colors up the side of your work, do not fasten off at the end of each row. With CA, chain 154 sts (or work a Foundation Double Crochet of 152 sts and continue to Row 2). Row 1: Work 1 dc in 4th ch from hook and each chain across, turn and drop CA — 152 dc. Row 2: With CB, ch 1 (does not count as stitch here and throughout), work 1 sc in top of first dc, ch 2, *skip next 2 dc and work 1 sc between the 2nd skipped dc and the next dc, ch 2, repeat from * across, ending with 1 sc in top of the turning chain, turn and drop CB — 76 sc and 75 ch-2 sps. Row 3: With CC, ch 3 (counts as dc here and throughout), work 2 dc in next ch-2 sp and each ch-2 sp across, work 1 dc in last sc, turn and drop CC — 152 dc. 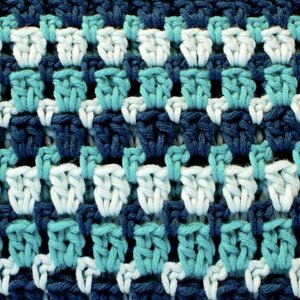 Rows 4 through 155: Repeat stitch pattern from Rows 2 and 3, but continuing with color sequence CA, CB, CC, through Row 155 or until desired length is reached. Round 1: With right side of your afghan facing you, join CA and work a sc edging around afghan. Work 1 sc in each st across top and bottom; 3 sc in each corner; and 2 sc along side edge of each dc row and 1 sc along side edge of each sc row. Join and fasten off. Round 2: Join CB in the back loop of any sc and ch 2 (counts as hdc), work 1 hdc in the back loop of each st around, working 4 hdc in each corner. Join and fasten off. Round 3: Join CA (as shown in photo; or CC if desired instead) in the back loop of any hdc and ch 1, work 1 sc in the back loop of each st around, working 2 sc in each of the middle 2 sts of each corner. Join and fasten off. Beautiful afghan! I’m not able to find those colours on the Borocco site. Do you have any other suggestions to try as I really like these colours. Is there a video tutorial of this by any chance? Such a lovely blanket, and clear pattern to follow! It seems like my blanket it’a getting wider as I go on though! Did you get a reply regarding your concern? Mine is not square either and I’m about 23″ done. I think I’ll rip it and find a better pattern. I really love this pattern. I’m doing it in the same colors as a baby blanket for a little boy. I think I will do a pink one next. Thank you for the wonderful graph. That really helped. Happy hookin y’all. I love the colors. Please, if I wanted to make a smaller blanket, what is the stitch count? I found this pattern after work and felt I had to try it immediately. Only problem I had with it was I kept trying to put double crochet inn where the single crochet stitches belonged. I guess I was more tired than I thought. Hi. I love this pattern. My sister loves sea glass and she just bought a new house and decorated it all in sea glass type colors so I figured this be perfect for her. But I have a question: I’m about 40 rows in and the blanket’s not even close to being 73 inches. My width was a little short too so I figured my stitches must be tighter than yours so I gradually loosened up my grip. I bought all the yarn you suggested so I was trying to figure out how long the blanket should be before adding the border so I don’t run out. 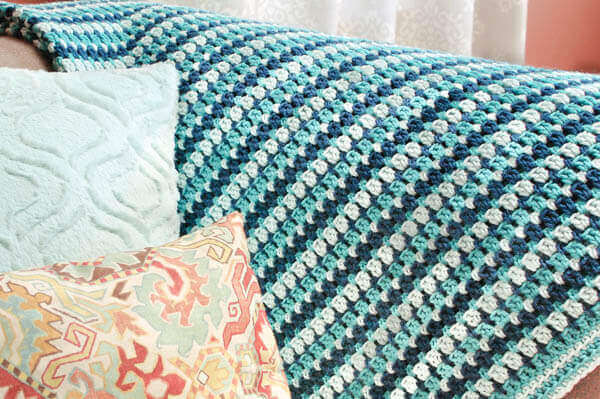 Is your count of 55 rows maybe just the double crochet rows? Hi Amanda 🙂 You are correct. It should say 155 rows, not 55 rows. I have corrected it now … sorry for the typo and confusion!! Excellent! That makes do much more sense. Thank you! I love the combination color of this blanket. Thank you for sharing the pattern. I finished it! A Seattle Seahawks inspired blanket for my daughter’s school art raffle. LOVE the pattern (even my husband likes the finished project!). Wish I could post a picture. Thanks for the pattern. I will use it many times in the future. Hi Kim 🙂 I’m not really sure why the edges seem off, especially since you have the correct number of stitches for each row. The only thing I can think is that perhaps you aren’t working the last single crochet of one row into the top of the beginning chain of the previous row. Either way though, when you add your edging it should smooth things out. Hope that helps. I am having a hard time keeping my edges from increasing. Any suggestions? I feel like I am following the pattern exactly but have had to remove multiple rows. Hi Tracey 🙂 Make sure you are working the last single crochet of one row into the top of the beginning chain of the previous row. If you still feel like your edges are crooked, when you add your edging it should smooth things out. Hope that helps. If I wanted to make a smaller blanket, what is the stitch count? Love this and the colors are beautiful. What a nice pattern that will be easy and fast to make since the colors are carried up the sides….hence there is no having a million ends to weave in once finished. I hate weaving in a ton of ends! I crochet blankets for Project Linus, so the faster I am at completing a blanket, the more blankets I can make for this wonderful charity. It looks like a great pattern that I can use college colors and also the professional team colors of sports teams to make blankets that the boys will like. Project Linus seems to also be in need for boy blankets. Thanks so much for posting your pattern! I so appreciate it! hanks! The pattern is fantastic – just perfect for the baby blanket I am planning to dió on my holidays! So in love with this! I’m getting ready to share it on my facebook page and I think I may attempt to make it this fall! I’ve never attempted a project this big. I have a question for you about switching colors. Do you have a link to your favorite way to do this? Do you cut and tie off between each color or is there a way to carry your color with you? I never like the way it looks when I switch colors. 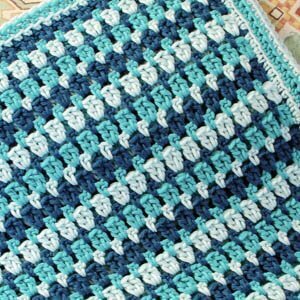 Hi Crystal 🙂 The beauty of this one is that you can carry the colors up the sides of the blanket … no need to fasten off and weave in a bunch of ends … yay! Yay! I’ve never carried over a color. Do you have any suggestions on a tutorial to show how to do this? It’s really pretty simple, I usually introduce my next color on the last yarn over of the row (see my tutorial here http://www.petalstopicots.com/2013/12/seamlessly-change-colors-in-crochet/) or you can really just finish your row and leave that ball hanging and just start crocheting your next row with your new color. You’re awesome! Thank you Kara! Took me about 2 minutes after I saw this to order the yarn. Love the pattern and the colors, thank you!! What a beautiful afgan, I think this would lovely in my granddaughter’s room. She has it decorated with a beach scenary. This is really nice! I’m not much of a crocheter but someday I’d love to make an afghan. This one is so nice and with a little help, I bet I could make it. Thanks for the pattern.